The Yomiuri Shimbun (hereinafter referring collectively to the Tokyo, Osaka and Seibu head offices of The Yomiuri Shimbun), fully recognizing the importance of privacy protection, sets "The Yomiuri Shimbun Guidelines for Privacy Protection" to ensure the protection of personal information we collect. The Yomiuri Shimbun will respond to requests for disclosing, correcting, amending, deleting and stopping use of personal information in accordance with the guidelines. The Yomiuri Shimbun recognizes that it is its social responsibility to protect personal information. To keep itself from infringing upon personal rights and interests of individuals, the newspaper sets and abides by "The Yomiuri Shimbun Guidelines for Privacy Protection" in collecting, using and keeping personal information. However, The Yomiuri Shimbun, in compliance with the related laws, exempts itself from the self-imposed guidelines in the case of personal information gathered for news-coverage purposes, which are governed by another set of internal rules for appropriate protection. When we collect personal information, we specify our purposes and collect such information in an appropriate and fair manner. When we use personal information, we do so for the specified purposes. If we plan to use such information for purposes other than those specified previously, we will seek consent from the person concerned in advance. Except for legally authorized cases such as entrusting information to outsourcing firms and joint use, we also will not disclose personal information to any third party without the consent of the person concerned. We manage personal information in accurate and updated form only for specified purposes. We take necessary and appropriate privacy safeguard steps to protect personal information from illegal access, loss, destruction, falsification or leakage. An internal privacy safeguard and security system works to protect personal information. We also appropriately supervise the outsourcing firms entrusted for the same purpose. When the person who can be identified by the personal information in our possession (hereinafter referred to as "the person concerned") requests that The Yomiuri Shimbun disclose to the person personal information about him/her, we will confirm his/her identity and disclose the personal information to the person concerned without delay unless otherwise provided by law. In addition, when the person concerned requests that The Yomiuri Shimbun correct, amend, erase or stop the use of the personal information about him/her, we immediately look into the case. If the request is deemed valid, we will take necessary measures. Inquiries about personal information or complaints over the mishandling of personal information are received by a special service section, which will handle them in a sincere manner in accordance with a separate set of procedures. Personal information is used by The Yomiuri Shimbun (including The Yomiuri Shimbun, Tokyo, The Yomiuri Shimbun, Osaka, and The Yomiuri Shimbun, Seibu) and the Japan News website to compile various kinds of statistics as required. The processed data may be divulged to advertisers or content providers. 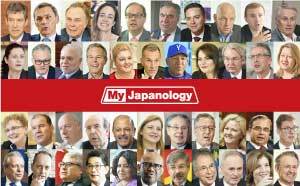 Personal information is used by The Yomiuri Shimbun and the Japan News website to identify participants in their questionnaires or quizzes and contact the winners. Personal information is used for the dispatch of information about products and services and prizes, publicity materials and questionnaires as Yomiuri Shimbun and the Japan News website advertising promotion campaigns as entrusted by advertisers. The Yomiuri Shimbun and the Japan News website will make minimum use of personal information to achieve the abovementioned purposes. We clarify the purpose of soliciting personal information each time we collect such information. We have a personal information protection manager at each head office to adequately manage personal information solicited on the Japan News website to protect such information from illegal access, falsification or leakage. Only the authorized persons are eligible for access to the inputted information. The servers storing collected personal information are, in principle, operated and managed by The Yomiuri Shimbun. When we use outside servers, we carefully select the outsourcing firms concerned and enter into information security and confidentiality agreements. Through Japan News website advertisements and special articles, The Yomiuri Shimbun solicits personal information at the request of advertisers or companies cooperating in producing special articles and supplies the collected information to third parties such as the advertisers concerned. In this case, we clarify the purpose of collecting personal information and identify the recipients of such information without fail. There are cases in which companies or organizations other than The Yomiuri Shimbun solicit personal information through the Japan News website advertisements and special articles by providing questionnaires, offering prizes or asking readers to contact them for further information. The Yomiuri Shimbun requires them to identify the recipients of such information and strictly safeguard the privacy. 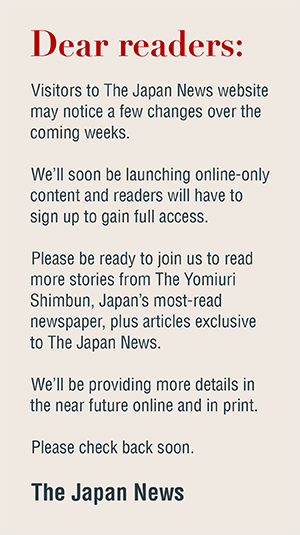 The linked website are not under the control of The Yomiuri Shimbun. Therefore, The Yomiuri Shimbun has nothing to do with the collection, usage and management of personal information solicited by advertisers and companies through the linked websites. Those who provide personal information through the linked websites or advertisers' websites are requested to read the privacy terms and conditions on each of such websites. * If you need the disclosure or correction of the personal information concerning you, read "The Yomiuri Shimbun Guidelines for Privacy Protection". A user can set their browser to notify them when the cookie function is activated on the browser. A user also can set the browser to accept the cookie function. * Questionnaires in advertisements and application forms for giveaways. * Job searches in the help wanted section. Cookies also are occasionally used to check conditions for the posting of advertisements. * For personal information inquiries, contact the Privacy Safeguard Section (Kojin Joho Hogo-gakari) of the Reader Services Center at (03) 3246-2330.